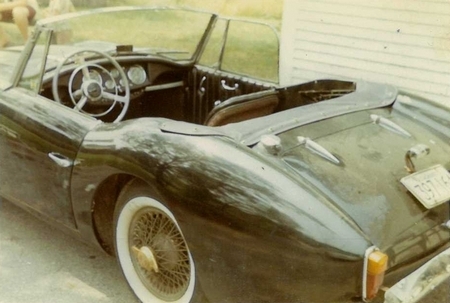 "It was probably 1968 when I was reading the Boston Globe classifieds and came across an ad for an Allard. Having attended races at Sebring, Opa-Locka, and Watkins Glen, etc., I was certainly familiar with the name Allard, but not the Palm Beach MKII. I really liked what I saw, and since it was a very rare thing for me to find a sports car that I had never seen before, I bought it. 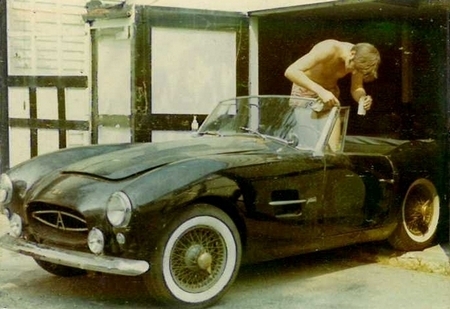 This was a left hand drive, black, Zephyr-powered driver. I have often read that they (Allards) had aluminum bodies, this one was steel. Although I was able to drive it home, the left rear shock mount had been knocked off of the rear axle making the ride downright poor. I never did get it properly sorted, so after eight years of ownership and very little use I decided to sell my wonderful Palm Beach MKII and have owned, driven and enjoyed Porsche 356’s ever since. I didn't take as many photos as I should have, but here are the only two that I have. Man, I was lean and mean at age 27!" Chassis 7104Z was the second (and last) Zephyr powered Palm Beach MkII, although its currently powered by a Chevy small block. It was one of two delivered to the US (out of six).